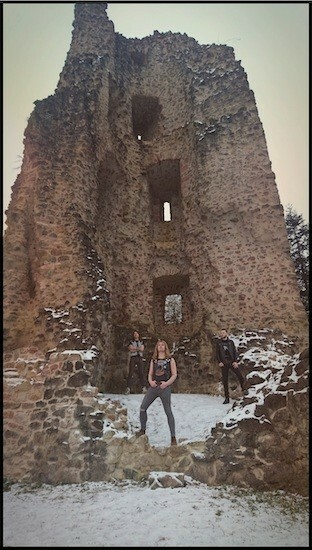 “Blackened thrash” was an overly simplistic label for the music of Germany’s Witching Hour even in the case of their first two albums, 2009’s Rise of the Desecrated and especially 2011’s Past Midnight…, but it’s an even more superficial and inadequate way to describe their new record, …And Silent Grief Shadows the Passing Moon, which is due for release on December 21st by Hells Headbangers. I suspect that most of us who are fans of black/thrash come to it for the blood-rush and the ferocity, for the feeling of demonic cruelty and chaos — intertwined with neck-wrecking riffs. 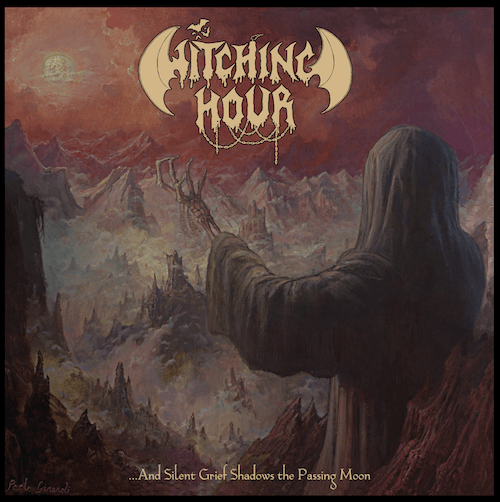 What we usually don’t expect, and what Witching Hour deliver through the new album, are other dimensions of sound, style, and emotional resonance that give their music a mystical, dreamlike, and even somber aspect in the midst of all the slaughtering. Those words may make little sense when you read them, and fortunately we have an example of the music itself to demonstrate the point. “As I Walk Among Sepulchral Ruins” is the name of the track we’re premiering today. An extended sequence of beautiful guitar notes, both glistening and scratchy — vibrant yet edged with a sound of sorrowful longing — provide the prelude to a galloping riot of lycanthropic howls and vicious slashing chords. But while the music becomes orders of magnitude more cruel and chaotic than the way in which it began, those gorgeous opening notes don’t completely disappear. The song is a mad slasher and thrasher, but variations on that opening melody resurface, giving the song a strong element of glorious brightness in the midst of all the blood-lusting hunger in the riffs, all the cavorting and catapulting drum work, and all the wild, savage barbarism of the vocals. And the song ends as it begins, like visions in a dream, which is just great. This is only one example of Witching Hour‘s song-writing prowess and performance skill. It’s the kind of song that stays with you, and that turns out to be true of the album as a whole. Hells Headbangers will release …And Silent Grief Shadows the Passing Moon on CD, LP, and cassette tape. It features cover art by the great Paolo Girardi. And it’s yet another reason to banish any thought that the year’s strongest records are already behind us on the calendar. If you let the Bandcamp stream continue after you check out our premiere, you’ll also have a chance to listen to the previously revealed track, “Sorrow Blinds His Ghastly Eyes“.